OK so in previous posts and messages I’ve talked about keywords being a good thing for your page. But if you take this to far you might be penalised for keyword stuffing. So What is Keyword Stuffing? Here’s what Google has to say on keyword Stuffing. Keyword stuffing” refers to the practice of loading a webpage with keywords in an attempt to manipulate a site’s ranking in Google’s search results. So it’s literally using a keyword or group of keywords too much on each page, either within the text or hidden. Over-using keywords within the text is likely to make your content unreadable for your reader / potential customers, as well as get your site penalised. So a good rule of thumb is to write your content for your reader, use your keywords if they are relevant to the rest of the page. Another way people stuff the pages with keywords, is hidden text. Text is written onto the page in the same colour as the background, making it hidden from your reader, but still visible to search engines. For example you could add whole paragraphs of listed words, using competitors names, branding etc. In fact in the early days this happened a lot, and lots the of the sites that led the results because of this some were advert heavy sites pushing their sales at you, some site even had harmful software attached. Now search engines can identify this using their algorithms are set so that this practice will likely lead to your site being penalised. This could be just a drop down the results or more likely your page being removed from its index. So it’s not worth the risk? Check your own sites keyword density, or frequency either using one of the many free tools on the web or on Pippas web. Bearing in mind that the recommended keyword density is from 3 to 7%, how keyword thick are your webpages? Goodbye to the Google’s Local business center hello "Google Places"
Political correctness gone awray seems to be hitting our favourite sites at the moment. 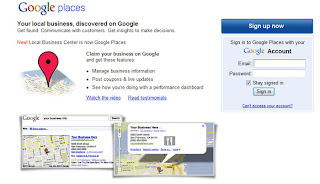 Today Google has changed the name of the section formaly known as “Local business Center”, has changed to “Google Places“. The press release claims it is to “better connect Place Pages – the way that businesses are being found today – with the tool that enables business owners to manage their presence on Google”. So far other than the name change, there don’t appear to much change for UK users. Service areas :previously available allowing users to set up areas that they cover, serve or deliver to. Enhanced listings ($25 per month) renamed “Tags.” Adding to its initial markets, Houston and San Jose (CA), Google is adding Chicago, San Diego, Seattle, Boulder and San Francisco. Business photos: free interior photography of the business. All these available to US markets only at the current time. Of course this is hot on the tails of Facebooks changing their “Fan pages” yesterday, previously you could become a fan of companies with their own “fanpages” however Facebook in their infinite wisdom decided that rather than become “A Fan” people would rather “like” the site. “Like” sounds a bit lame to me. Although what could it be replaced with, Twitter has “follower”. So what would you call someone who signs up to your companies page? Stalkers, groupies, readers ???? Suggestions via comments box please. Everyone is going on about keywords? You can’t carry out any kinds of SEO (Search engine optimisation) on your site without looking at keywords. But what are keywords? Essentially keywords are the words that people will enter into search engines to find your website. For example if your site sells double glazing, then the kinds on words you use would be double glazing, windows, replacement windows, conservatories. Your job is to tell the search engine what words you want to be found under. The search engine will then decide how relevant the site is to those keywords you’ve selected and then how popular your site and page is (the number of links to the site) and then it applies it algorithms to determine where to position your age in the results. How do I choose my keyword? Ok as it’s your site, and to set up your business and site I’m sure you looked at the competition, so I’m sure you’ve got some ideas about the words you want to use, but for interest, or to give you some new ideas why not try one of the many tools available on the Internet. One free tool is Googles Adwords tool (it’s meant to help people pick their keywords for their adwords campaigns but will at least give you some clue as to how popular certain terms are. Just enter your website and it’ll suggest some keywords (don’t list them all, they won’t all be useful). Think about the words you chose. If you clean carpets, you don’t necessarily want people looking for new carpet. You may also want to consider using long tail keywords rather than just short tail ones. A short tail keyword is the widest and most commonly used term for example carpet, a long tail keyword would be something like commercial carpet cleaning, residential carpet cleaning, pet friendly carpet cleaning etc. So how can we tell the search engines where we want to be found? A good place to start on your site, on each page is to use Meta tags. Each web page is normally constructed using html or another code. HTML has two sections (The head and the body of a document) in the head section of the code, goes the information that is not designed to be seen, information like the page title, description, the keywords, links to CSS documents etc. The body is the coding that tells browsers what to put on the web page and how it should look. So as long as you have access to change information in the head of your page you can set your own keywords. The Title of the page I would normally add you company or site name as part of the title, for example “Pippas Web: basic SEO services for small businesses”. The title should be unique and relevant to what is on the page. Guess what everyone calls their first page, home! Try to think of something different. The keywords are added using a Meta tag. They are added separated by a comma, and a space. For example web design, SEO, HTML, etc…. words can be listed individually or in groups for example Horror, cheap books, true stories, books Although be choosey, you should ideally have 4-5 main keywords per page (the rest can be variations of the wording in order to get the widest coverage) and no more that 20 in total per page. But remember you can and should have different words for each page so you can spread your keywords around. The page description should also appear in Meta tag, it should give an explanation about what is on the page, ideally using some of the keywords already listed. The contents of the body section or the writing on the site itself should include your chosen keywords; remember them in headings, when using Alt tags for images and in the text itself. However, don’t just cram them in for the sake of it, at the end of the day you can have the number one slot on Google, but if no-body can or wants to read your site what’s the point??? On their own these things will only help guide Google to when to list your site, the other aspects of SEO like link building help to determine where in the results your site should go. Ok so your site is now focused on your keywords, you’re next job is to get links to it. Where possible use your chosen keywords as the anchor link, the text that the link is hidden behind like this SEO, it’s not always possible but if you are requesting links, or if you can choose, choose your wording wisely. Your choice of keywords should not be set stone, you might want to tweak them, change them to reflect the current content of your page. So you’ve got the site, you’ve picked your keywords, now what do you do? Link building is an important part of SEO, Google and the other search engines see each link to your site as a vote for your site. However not all votes are equal. Where to put the link. The linked itself can be entered in your text, for example if the forum post says “help everyone I’m looking for someone who does accounts in Worcester” then here’s a good chance to plug your business, if you’re an accountant in or near Worcester, if you’re a hypnotherapist in Hampshire not the best time to mention it. However a lot of forums allow you the chance of adding a signature that gets posted at the bottom of each reply you make. So make the most of this adding your website, to your signature, then you can focus on the job of finding interesting things to say that will make curious people click on your link, to find out more about this person. 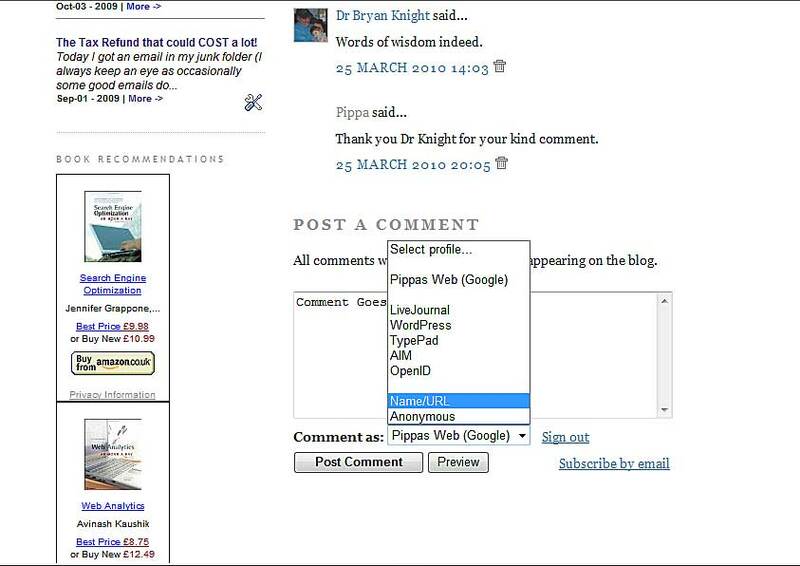 With blogs it is pretty similar, most blogs encourage comments at the end of page. 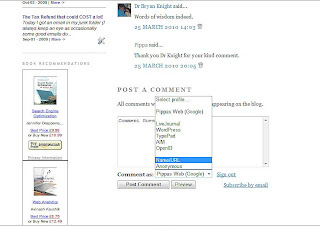 Depending on how the blog is created will determine the appearance of the comment box. On mine under you’ll find a bigger box to add the comment under which is some drop down options on how to sign, you can use your Google id or the easiest way is to chose name/URL option. which opens another box in the name, you can add whatever name you want, and then add your web address in the URL line. Be aware some blogs allow your web address to show as soon as the comment is published (like mine), others you may have to contribute a few times before it shows, this is to deter spamming programs adding rubbish to the blog while still adding URLs. The comments to this blog are monitored, this means that, although I would love it for you to leave me a comment, it won’t appear straight away, I have to go in an approve each comment, these allows me the control to stop any spam before it is listed. The most time consuming part will be setting up your profile and signature, then just as you have a spare few mins log in, check for new messages you can reply to, new blog articles you read and comment on, each comment / reply is a vote for your site. So why not leave me a comment about what you think about this post, or the blog in general and help your business at the same time? 18months ago the idea of SEO (Search engine optimisation) was something I didn’t have a clue about. I’d seen it mentioned on some sites but to me it was something that techie geeks did and Google just found sites and put them up randomly. Little did I know. I’ve even now joined some forums where I am confident enough to offer my opinion on what can be done. And here are some things that I have learnt about SEO. Only the people who work for the the big search engines know how they work, everyone else is just guessing. Everyone has found that different things work, so think that their way is right. SEO is not something that will give instant results, the search engines have a lot of pages and sites to check through, so it can take awhile for them to check if you changed the title on your page, or a keyword. There is an phenomenal number of free directories that allow you to submit your website to get a backlink. I would love to know if “normal” people ever use these to find businesses, or is it just people advertising their sites??? It’s easier to optimise sites with more text. But make sure it’s relevant to what the page is about. Don’t just add it for the sake of it, use your keywords and keep it all focused. Anyone can do it! The only difference between you and the person who phoned to offer SEO services, they’ve done it before so it’ll be quicker and smoother for them, however if you’re starting out and are on a budget, why not do your own SEO. Read around the topic there’s plenty of info out there, find out about different things you can do, to improve what Google thinks of your site, article writing, forum and blog contribution, link building etc. A blog is the the common term for a web-log or an online journal, documenting events, thoughts, theories or news. Blogs are usually written by one person about one thing, although this is not always the case. There are so many different blogs each with their own layouts, style of writing and features. Although most will have some key features in common. Archive; The front page of the blog will hold the latest few entries and older ones are listed in the archives. Usually in date order. Comments box; after an entry on a blog, there is usually a comments box. It allows the people who read your blog to comment on what you have just written, so that the blog can become interactive and not just a one way preach. Some way for people to be updated when new blogs are posted: RSS stands for Really Simple Syndication or Rich Site Summary. In essence they are files that tell specific website software that a website or blog has updated it’s content, without the need to visit the site. This file can be picked up by various software, Google.com offers users Google reader or even the ability to add boxes of different blog updates on your home page iGoogle. Windows live mail also has a feed reader. The aim of a blog will depend on if it’s a personal one, or if it’s a corporate one. A blog for a company could help encourage readers to become customers. Discussing your products or services on the blog is another form of advertising. As well as Pippas web blog were you can find out more about the tax refund that would cost you money, I also try and update a more personal blog, looking at my family life. Microblogging is part of the social networking culture currently leading the way on the web. Sites like facebook and twitter ask their users to write short statements about what they’re doing, thinking about, or reading. In effect a short blog shared with friends or followers. Facebook gives you an almost unlimited space to type, but Twitter the status is limited to 140 characters. In my personal experience facebook is more for finding people you already know and leaving messages for them, twitter is more about finding people who you may or may not know in the real world but that you share an interest with. For example people who write about the type of work you do, or others Mums. To follow me on twitter click. The Tax Refund that could COST a lot! Today I got an email in my junk folder (I always keep an eye as occasionally some good emails do find their way into no-where land) the subject was “Automated Tax Refund”. 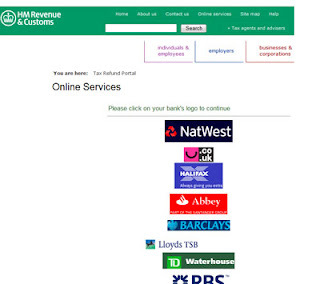 The email was set up to look like it had come from HM Revenue & Customs (HMRC) including official headers, logos and the senders name had been set to look like it came from HMRC. inconveniences and thank you for your co-operation. However alarm bells started to ring. 1) How would they have my email address? HMRC usually send letters out in the post, even for a tax refund, to say a cheque is on it’s way. 2) Although it had come to my main email account no-where on the email does it in fact state my name or any kind of identifying ref number. 3) The email asked me to use the link on the email to visit their site, to claim my refund. A quick search on Google confirmed for me that this was in fact a phishing scam. Basically someone is trying to Phish / fish for your details; be they password and username to sites or in this case bank details. This kind of email happens a lot under different guises. In the past I’ve had ebay and paypal – there’s a problem with you account please log in here and confirm it’s ok…. Or banks saying you need to activate your online banking by loggin in via this link. If you receive and email along these lines or are unsure of how legit it is, then DO NOT USE THE LINK on the email. Google part of the email to see if anyone else has had this scam. Go to the site in question, i.e. eBay, paypal, your bank as you would normally and check your account if a message has been sent from them (Highly unlikely) there will be a record on the site. For the benefit of this blog and to save you from having to I clicked on the link and rather than taking me into the HMRC site which you would expect if this had been real, I got a list of different bank logos to select from. 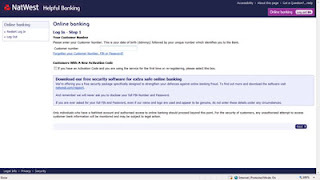 I picked on randomly just to see what happens, you are then taken to what I presume is a mock up of your banks log-on screen and asked to log in. If I had actually logged in, the sender of the mail would now have my log on details to my bank account and the ability to make payments to whoever they want (not that they would have got a lot from me haha). No legit company would be offering a refund into your bank account like this without actually checking you are who you say you are (No details on the email or on the link). Please read emails carefully, if you think it’s too good to be true, it probably is. Check if other people have had similar emails by searching the net. NEVER EVER give out bank details, passwords, or personal info unless you are certain you are on the official site and not a very clever mock-up or you could be stung. PS. Apparently there is an identical mail being sent to Americans as though it’s from the IRS rather than HM Revenue & Customs. Beware the global Internet means we have Global phishing too. CSS what is it and do I need it? Cascading Style Sheets or (CSS) works alongside Hypertext Markup Language (HTML). HTML is the code that tells a browser how to display a web page. Previously in HTML you had to code every row to describe the fonts, backgrounds, positioning etc. CSS allows you to to state how the layout of the site will look, ensure uniformity across different pages, and it allows your web page to download quicker, helping to make sure that your potential new customers don’t get bored and go find someone else’s site. CSS code can be on either a separate document, written in the header of the HTML web page, or even written inline with the HTML code. depending on what you need that bit of code to affect. At it’s most basic you can code CSS to make all your text written in H1 the largest title tag across your site to be written in red, bold and in Arial. CSS code can be used to arrange the layout of the page. It can create areas on the page for the text to be displayed in columns or blocks, or it can be used to position and stack images. Linking your regular HTML pages to a separate CSS document makes it easy to change presentation, layout and general appearance of all linked pages very quickly. You need only to make the changes on the one document, not every page on the site. Do I need it? Well it depends on you and how user friendly you want your site to be behind the scenes. It is still possible to code a site purely in HTML, but this takes a lot longer as you can imagine having to describe how every line of text looks. CSS reduces the initial time it takes to code the the site but also makes re-designing sites or making changes to the whole site a lot quicker and more efficient. Most sites these days will be designed using CSS and HTML, but if you’re getting someone else to create your site, it is always worth checking.